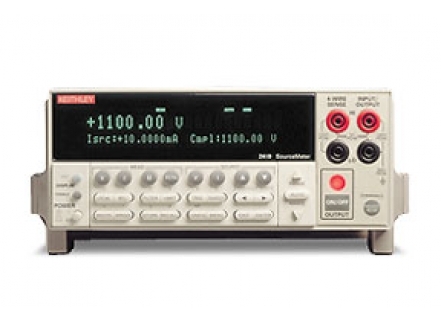 The Model 2420-C High Voltage SourceMeter® is a 60W instrument designed to source and measure voltage from ±5µV (source) and ±1µV (measure) to ±60V and current from ±100pA to ±3A. Production test applications for the Model 2420-C include resistors and resistor network devices that must be tested at higher current levels, thermistors, solar cells, batteries, and high current or medium power diodes, including switching and Schottky diodes. The Model 2420-C is also suitable for IDDQ testing of CMOS integrated circuits and monitoring the current consumption of battery-powered medical devices such as pacemakers. The Contact Check function makes it simple to maximize test integrity by verifying test connections easily in just 350µs before an automated test sequence begins. This eliminates measurement errors and false product failures associated with contact fatigue, breakage, contamination, loose or broken connection, relay failures, etc.